Reverse-engineering our food is a skill which is somewhat taken for granted in my family. When we try a new dish that’s good, Mom is likely to start a discussion on what ingredients had been used and how it had been prepared. And then maybe a week or two later, that dish would be home-cooked for us. Mom comes from that generation of cooks whose recipes are stored in the head. Nobody seems to write anything down. You work with gut feel and instinct. And a whole lot of guess-timation, trial and error are involved in the process. And as far as my mom is concerned, it is rarely too late to rectify whatever it is you are cooking. It’s been pretty much like that for me. I’d eat something yummy, and automatically think about how I’d cook it. But I haven’t developed the habit of making proper notes. So there are times when I actually forget how I’d cooked something previously. And I end up having to re-invent it. Or wing it. Depends on how you choose to see it, I suppose. But I am getting a little better. These days I make scribblings of ingredients at the very least. Although quantities still tend to be estimates, they are usually quite accurate. I love the challenge of experimenting with recipes which are new to my kitchen. I’d suddenly get it into my head that I just have to cook say, Beef Rendang. Or Laksa. Typically, I’d do a little research and check out a couple of recipes, before I decide on how I’d do mine. On one of those occasions, it was Pineapple Fried Rice. So I called my fruiterer, and off I went to pick up a sweet, fresh pineapple. 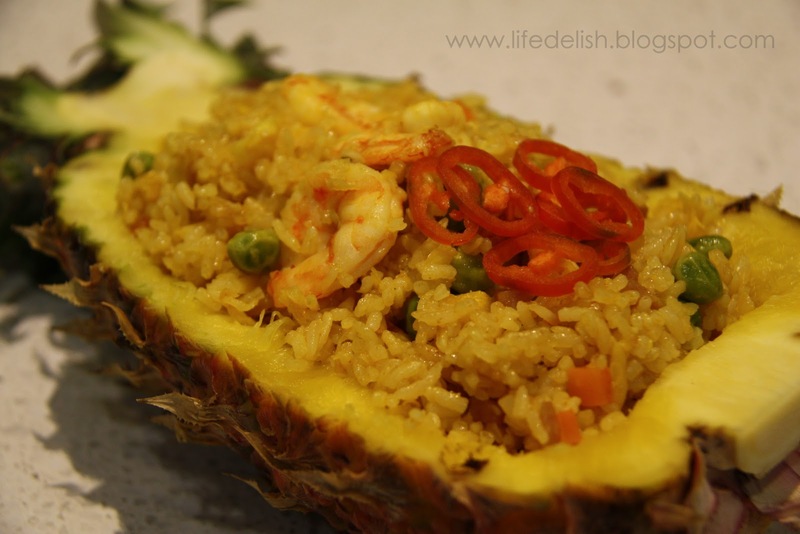 The Pineapple Fried Rice based on the recipe here is very tasty – sweet and savory at the same time, and the rice is soft and moist. I’m not sure if you can call it authentic Thai Pineapple Rice, but it is delicious all the same. It’s relatively straightforward, not difficult to do, plus the good news is that for this one, I actually made notes while the recipe was still fresh in my head. Heat oil in wok on medium-high heat, fry garlic for perhaps 3 minutes, followed by onions, and cook till fragrant but not brown. Add lap cheong and cook till edges are slightly charred. Add prawns and stir fry till they just turn all pink, then add curry powder, fish sauce and soya sauce. Mix well, add rice, peas and pineapple and stir till well-combined. With a spatula, press down on the rice so the grains separate. If desired, add salt and pepper to taste or adjust seasoning. Serve in pineapple shell and garnish with chilli and coriander.